WARNING! This is likely to be the most boring thing I have ever written. DEDICATION: I dedicate this to my older brother, Paul, who loves data and odd collections of numbers and bits of information that others might not think twice about. 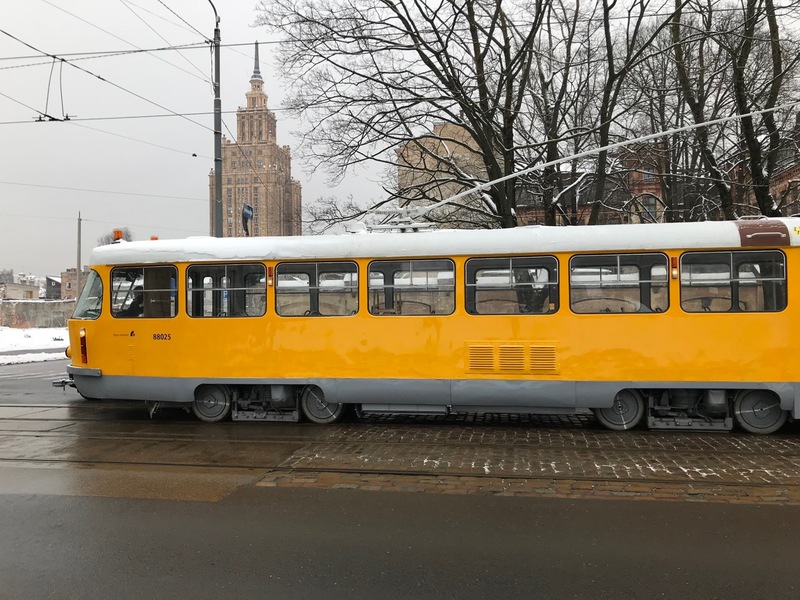 I live a few blocks away from the Turgenev tram stop, and tram #7 takes me directly to the Latvijas Nacionālis Teātris which is very near to where my multiple teaching jobs are located. As a result, throughout the winter, when the weather was less than desirable, I rode the tram quite frequently. What is a tram? The official word in Latvian is “Tramvaju” and they are light-rail electric trains that carry passengers across town. There is no subway or elevated system, so the trams just follow the regular roads to the dismay of all Riga drivers. As Omaha contemplates maybe some day getting something like this, Latvians have come to depend on these reliable and somewhat comfortable (sometimes not smelly) transportation services as a matter of daily life. 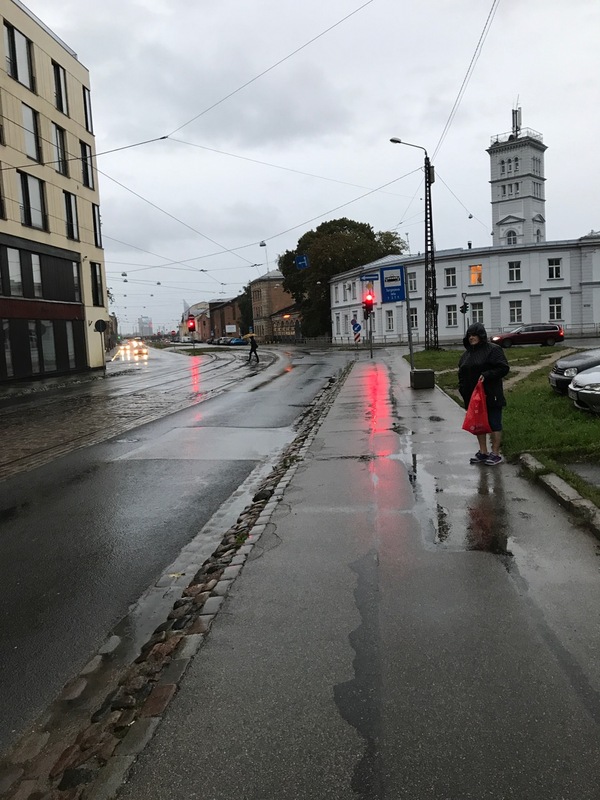 My commute takes about ten minutes each way, and because I am a public school teacher, I get to ride any public transportation any time anywhere in Riga for 16 Euro a month. Why not? So, one day, I decided to start keeping track of which tram I was riding on. I just wondered how many trams there are in Riga and whether or not I was riding on the same one each day? I wondered if the trams were random or if there was some order to them? I wanted to learn. These are the things I think about on any given day. Don’t judge. Trams are numbered in two ways. 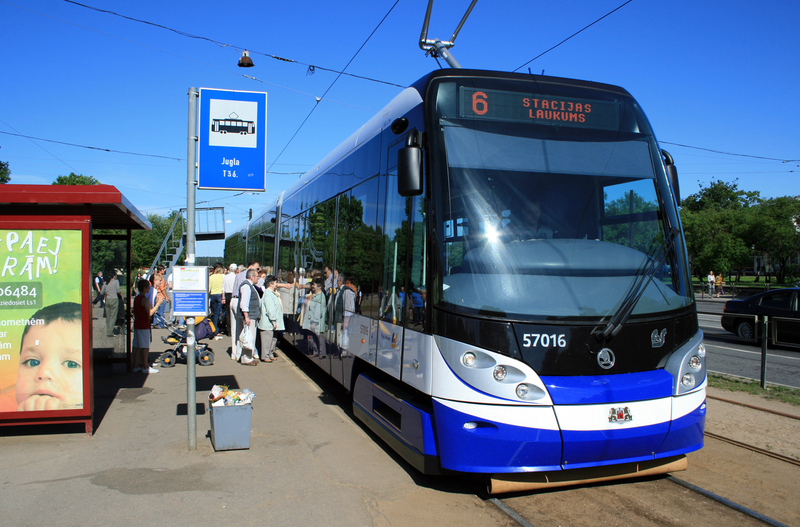 The main number (1-11) tells you which route the tram is on, but each tram also has a serial number which tells you which specific car you are riding on. I guess I became curious when I got on one tram which had orange rails when most of them are painted blue. I knew the new trams were different from the old, but now I realized that even the old trams were individualized and somehow deserved to be noted and remembered. If you ever want to see how to get around Riga via tram, trolleybus or bus, just check out 1188.lv for information! Side Note: I just realized that I do not know if the front car and back car have different numbers or not when they are linked together. Now I feel like all of my data might be off. More research is needed. If you are traveling to Riga, the public transportation system is quite efficient. 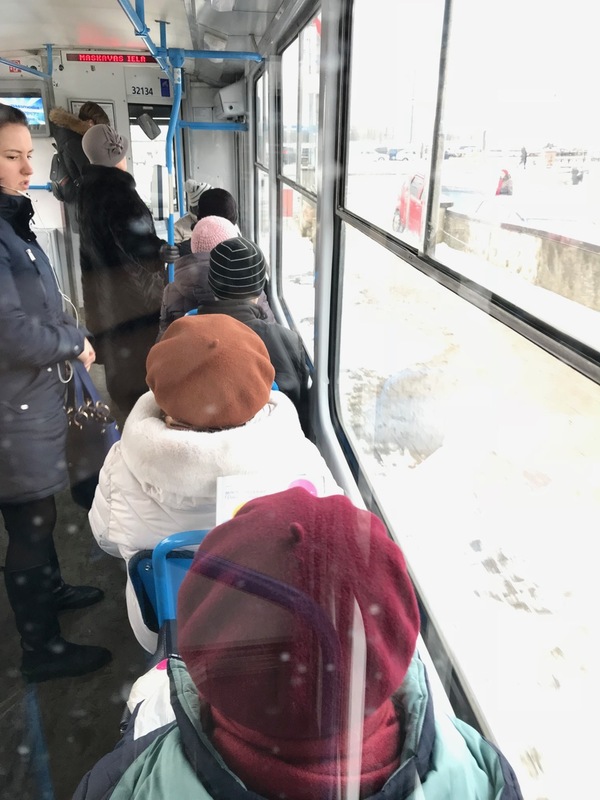 I know that other Riga residents complain about the smell of some of the trams, and sometimes they are crowded, but for the most part, they get you there on time. My biggest issue is that I run out to catch the tram in the morning, only to find that it was 2-3 minutes early, and is already leaving before I get there. This just teaches me to be more disciplined. And during the morning and evening rush, the trams show up at 7 minute intervals, so even if I miss one, I don’t have to wait long. Just for the record, I have 151 photos of tram serial numbers stretching over the past 4 months or so. I did not take photos of every tram ride I took, but I tried to get most of them. Sorry, a lot of them are selfies, and if you are really bored, you can look through them! They will be at the bottom of the page in all of their glory! I know it sounds crazy, but I have been trying to write this blog post for a long time. I have decided to share some little stories from the tram this winter. These are distilled to short little bite-sized observations. I see her most working days in her matching coat and hat. She has at least three very colorful varieties, and she always looks serious and sometimes angry. One time, I saw her step onto the tram and some young woman was sitting in one of the “old lady” seats. She stood there glaring at the girl until she finally gave up her seat. There are rules to riding the tram, unwritten, but more important, perhaps than the laws on the books. You get up to let the ladies sit down. She is a keeper of this code. He gets on the tram near the market and rides, sitting on the floor, drunk or hungover with his long face and disheveled clothing. 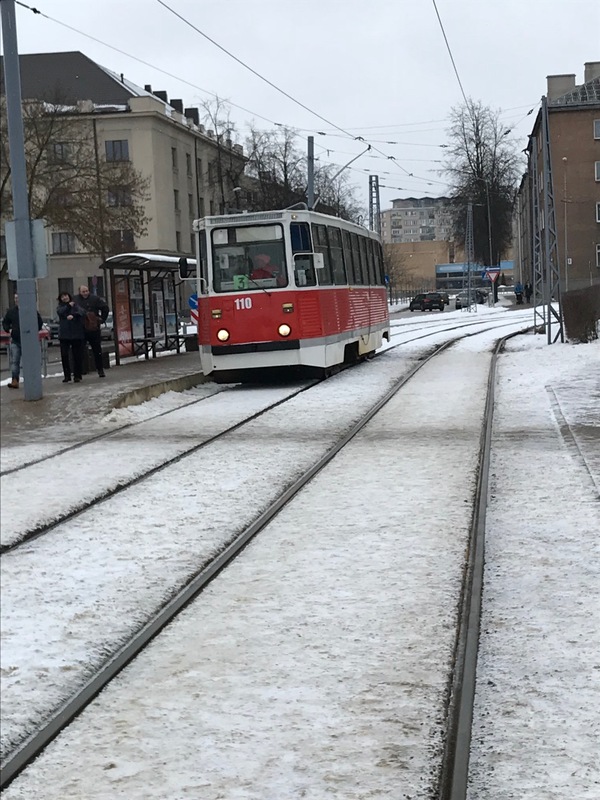 On one winter day, the tram police were checking for cards, and he did not have one. They told him to get off at the Opera. They got off, and so did he, but as the doors were about to close, he jumped back on with incredible speed and sat on the floor for the duration of my journey. These two young men ride the tram on school mornings. They are both red heads, and the older brother is very short with some hair on his face. He could be any age from 15-30. I cannot tell. But there is an unspoken devotion between him and his smaller sibling. They always stare at me like I am some kind of sight-seeing object. I want to speak with them, but I am afraid that they wouldn’t understand or might even ruin our delicate understanding. One thing I love about Latvia is that kids are free. They aren’t taught to be afraid to do things, and they go outside and play and ride bikes and do stuff that we used to do back when the world was more normal than it is today. So I was so happy to see this girl who lives somewhere near our flat dominating the tram. She gets on, finds a seat, and gets off and heads for home like she owns the world. It is hard to explain the confidence that I see in the young people here. It isn’t that cockiness of the kid whose mom bought him an expensive pair of sneakers, but the real self-assuredness and lack of fear that all children should be blessed with. An innocent understanding that if we do what we are supposed to do in life, then everything else will be okay. The world isn’t out there to hurt us or destroy us, but for us to explore and learn from. Maybe I see too much, but she was an inspiration, nevertheless. 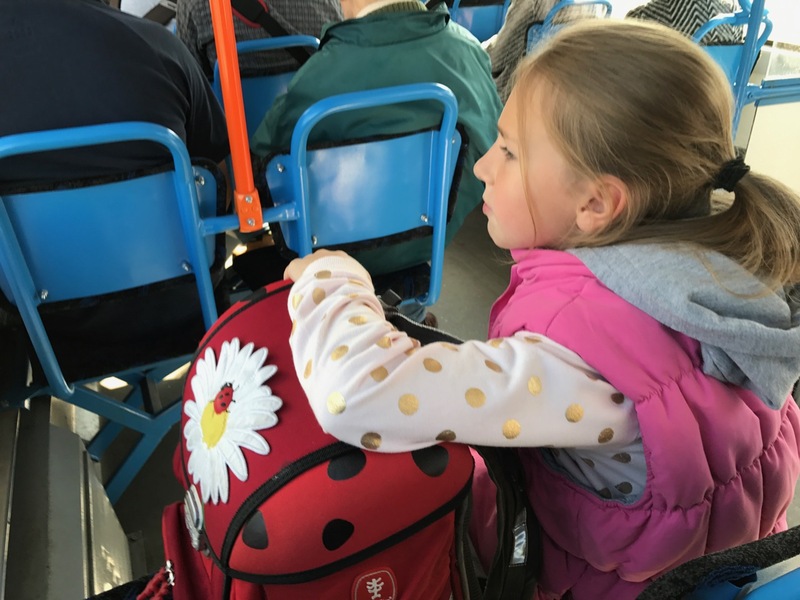 This girl, is, of course, just one example of many of these free-spirited young people who use free public transportation all over Latvia to get to and from school each day. Call me sentimental, because I am, but I see so many old ladies in Latvia who remind me of my mom or one of my aunts. The kids I teach make fun of public transportation because it is crowded with elderly people, especially when you hit the central market. Public transportation is free as a part of social services for pensioners, so they can ride whenever they want wherever they want. So why wouldn’t they? My favorite thing is to see these older men and women sprinting to stops to catch a bus or train. 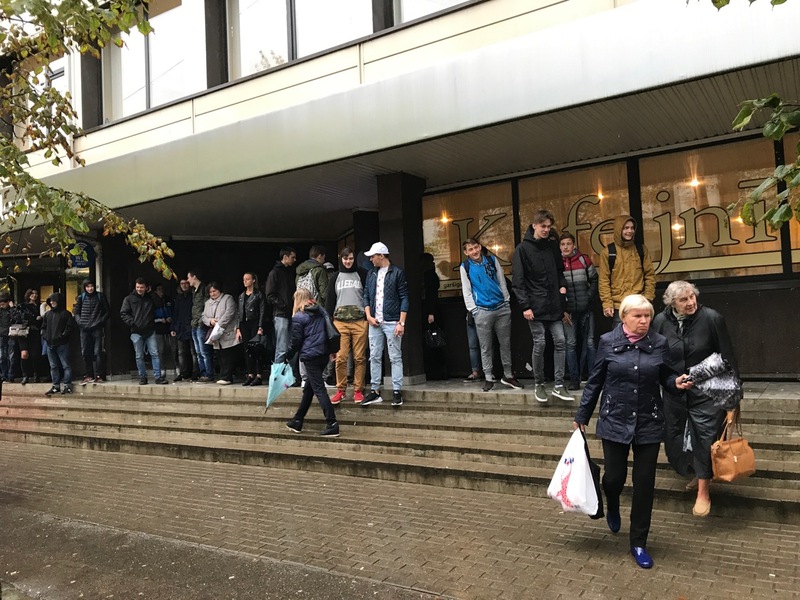 It could be the national sport of Latvia and likely explains their strong showing in past Olympics in the sport of walking. 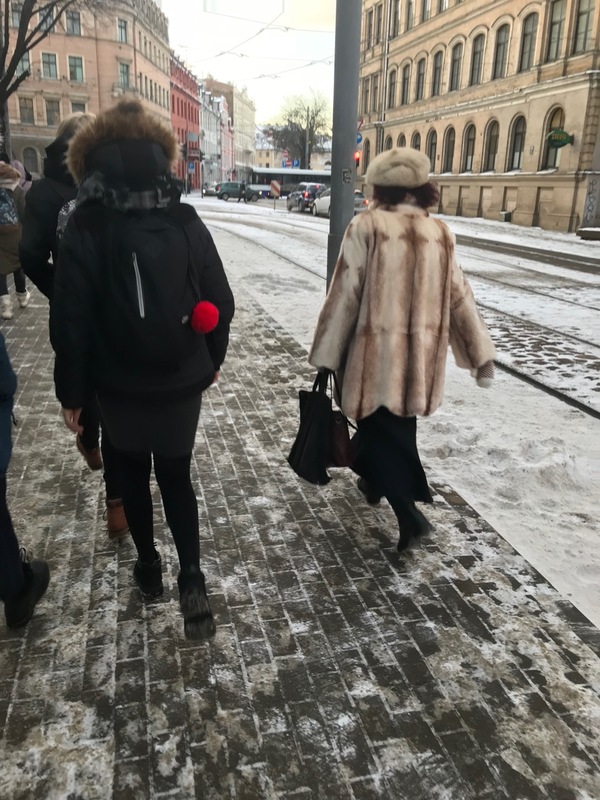 They never want to look like they are running because Latvians have a certain dignity, so they walk, faster than most people run, toward the stops. It is incredible. So sometimes I take pictures of the hats on the tram. The old ladies, all have different looking but much the same feeling hats. It is like seeing winter flowers. Trams are currently manned or womanned by human beings pushing buttons and guiding them through the streets. The one variance of their duty to simply keep the tram on the tracks is to sound their horn at anyone who gets in their way, even other trams. One particular driver must have had his own version of Latvian tram road rage because he was just sounding this loud, annoying horn every five seconds. At one stop, another tram was on the tracks, in his way. I think the other driver was taking a smoking break, so our driver just sat there pushing that horn button like there was no tomorrow. God bless that tram driver! This was likely the same driver who threatened to throw this young woman off the tram for not getting up to let an older woman sit down. I don’t know if that particular case makes him a hero or someone who is overstepping their authority a little bit. What do you think? But can you imagine sitting in a little cabin for 8 hours a day basically just avoiding accidents? I am glad for them, but I don’t think I could do that job! STRESS! 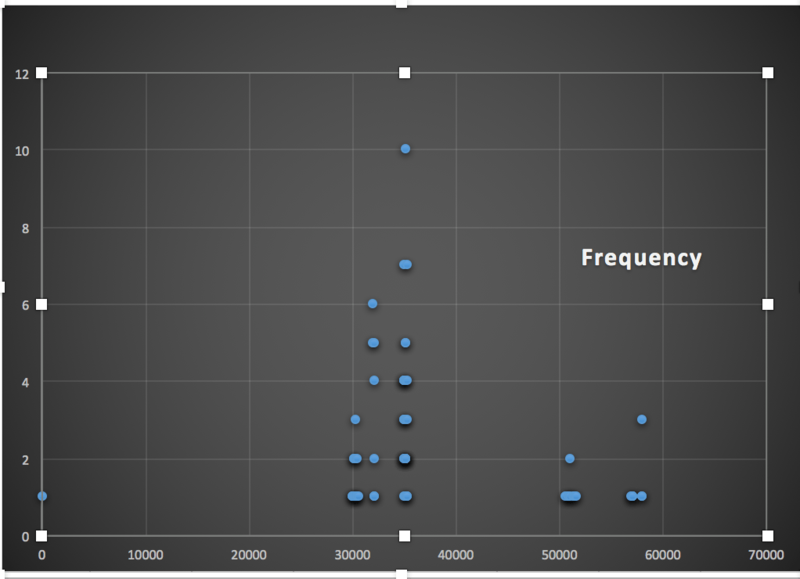 I promised data analysis, but I really am not good with Excel graphs and charts. I don’t know how to make this meaningful. However, over the past few months, I have ridden 63 different numbered trams. The most frequent tram was 35228 with ten rides; however, most of the trams were ridden only one time. Most of the trams were in 3000 range. Every tram 57xxx or higher is a new model, and these trams are not on my regular commute. I am not sure what all of the numbers mean, but the Riga trams range from 30024 to 35304 and 50574 to 58055. Maybe someone with a better understanding of things can figure it out. The main mystery for me was whether or not the same trams are used in the same places at the same times. I do not think so, or else I would have been on the same tram more often since I leave at the same time most mornings. The one anomaly in the data is the outlier far to the left. This is the dot of the tram in Daugavpils which was number 108. It was a whole different tram line, but I felt like I should include it. 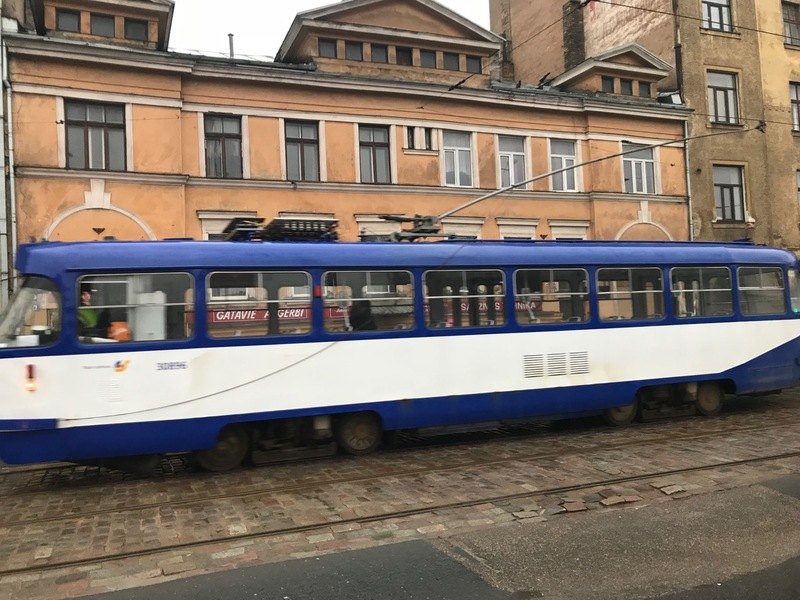 It was a completely different experience and about 1/5 the cost of the Riga trams. In other news about data, when I look at a map of all the photos I have taken in my library, apparently, I have taken 5700 photos in Latvia over the past several month, and only 6300 in the Nebraska over several years. Maybe there is some study about the meaning behind that? As a teacher, I can ride public transportation as often as I would like for 16 Euro a month. 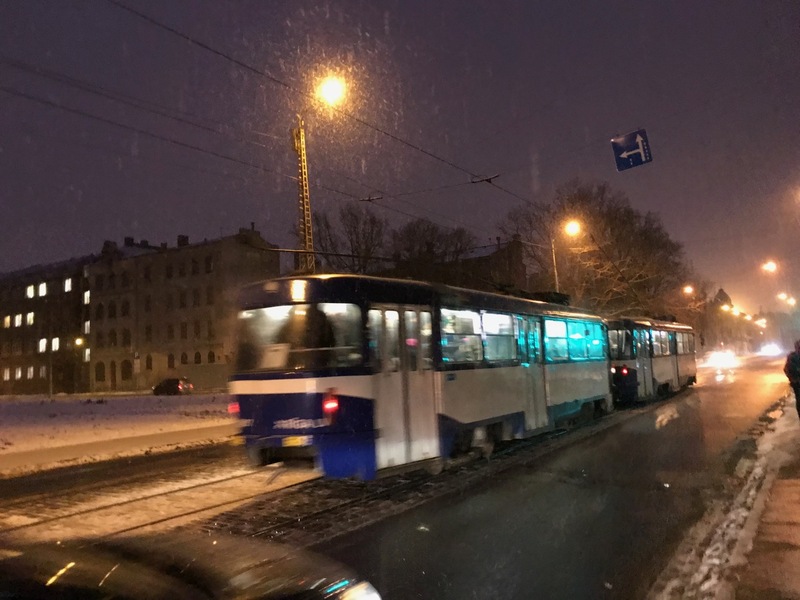 I keep saying, “I am just going to go out one day and ride the trams to every stop… from one end of Riga to the other.” I still have not done this. So at least I have something to look forward to. I think the only tram I have actually been to the end of the line is 7 and it ends near my cousin Bruno’s flat. So the first tram I likely rode on in the summer of 2016 with my sister Susan (when we didn’t know how to pay and were completely clueless) was also the one I would end up riding for most of my days here as a commuter. Harmonious. Note: If you have been accidentally depicted here against your will, I apologize. Let me know and I will take the photo down. I figure that I am seen here at my worst, in the morning, at night, tired and cranky. So if you are somewhere in these photos, sorry!